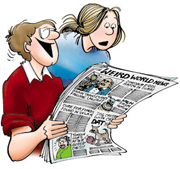 April | 2015 | FBorFW Strip Fix For Better or For Worse Comic Strip by Lynn Johnston. Lynn's Comments: This punch line came from Jim Unger's brother, Bob. Jim, who did the wonderful cartoon panel, "Herman," had come with Bob to visit us here in North Bay. Soon after their arrival, I served them a big breakfast and noticed that Bob was wearing a rather hideous sweater--kind of a greeny-yellow, rather "pilly," and in need of a wash. When I made a crack about the sweater, he leaned back in his chair, scratched his tummy and said in his thick British accent, "I've got a sweater for every day of the week--This is it!" I never forgot the line and shamelessly used it in this strip. I don't think I ever told him--and he died not long after their visit. Jim, sadly, has gone, too, so this strip is a nice reminder. This entry was posted in Uncategorized on April 1, 2015 by stripfix. Lynn's Comments: The other day, I discovered a tiny dress in the back of my closet. My daughter, Katie, had worn it in the Lynn Lake United Church Easter parade, and I still had it! There was a matching bag and hat. I showed them to Kate and said, "Can you remember being this small?" Having a three year old now herself, made the dress and accessories even more interesting. I'm hoping she keeps some of her children's favourite clothes because photographs can't show the actual size the child was. Holding the small dress was like touching my little Katie again! Sorry, I won't apologize for being sentimental. That's what moms do! This entry was posted in Uncategorized on April 2, 2015 by stripfix. This entry was posted in Uncategorized on April 3, 2015 by stripfix. Lynn's Comments: I wanted my son, who really had a good ear for music, to take piano lessons. In an effort to encourage him (and to learn myself) I arranged to take lessons with him. We went to a particularly strict and humourless lady who treated us exactly the same way. Admonishments like, "Keep those wrists up! Do you want to play "McDonald's Farm" for another week?!" were doled out to us both. I earnestly wanted to learn how to play the piano, but I fully understood my son's reluctance to practice because I hated to practice, too! Neither of us looked forward to the lessons, so neither of us worked hard to learn. This is a sad admission. I wish we had focused on our talent and not on our teacher! This entry was posted in Uncategorized on April 4, 2015 by stripfix. Lynn's Comments: My dad loved to invent characters and to story tell. When he read a book to us, he read like a practiced thespian. He spoke with accents, changed the pitch of his voice, and made fairy tales come alive. When I did this strip, my dad had been gone for a number of years. I was able to bring him to life again by writing and drawing short vignettes like this one. It would have been just like Dad to call and pretend to be the Easter Bunny! This entry was posted in Uncategorized on April 5, 2015 by stripfix. Lynn's Comments: As a professional trumpet player, my brother, Alan, introduced me to some wonderful music, and to artists I might never have learned to appreciate--like Wynton Marsalis. A dear friend of mine wound up in the hospital one time and was in so much pain, there was little we could do to comfort him. I took him a cassette player, headphones, and some tapes--one of which was Wynton Marsalis. This music, he later told me, made his illness bearable and aided in his recovery. I wanted to say the name Wynton Marsalis out loud in the newspaper to thank him for helping my friend. I wonder if he knows how much his gift means to the people he shares it with. This entry was posted in Uncategorized on April 6, 2015 by stripfix. This entry was posted in Uncategorized on April 7, 2015 by stripfix. Lynn's Comments: My friend, Ghislaine, has been a teacher for many years. She is strict, smart, funny, and fair. She has recently begun to tell me some of her adventures with today's generation of teens, and the things they do and say make me cringe. The reward in teaching, she tells me, is that, "now and then someone learns something." Interestingly, this strip was published almost 30 years ago! This entry was posted in Uncategorized on April 8, 2015 by stripfix. Lynn's Comments: I remember telling my mother I was not a servant! As a mother and grandmother, I now know what a "servant" really is! This entry was posted in Uncategorized on April 9, 2015 by stripfix. This entry was posted in Uncategorized on April 10, 2015 by stripfix. This entry was posted in Uncategorized on April 11, 2015 by stripfix. Lynn's Comments: About three months ago, I took a few days to clean out all my kitchen and studio drawers. I discovered pens, pencils, erasers, tape, scissors, glue, push pins--enough to open a small shop. I put everything away where it should be and made sure to place supplies close to the phones. Yesterday, I called a friend to ask for an address--and I couldn't find a pen!! This entry was posted in Uncategorized on April 12, 2015 by stripfix. Lynn's Comments: Although I never saw my children trying to eat from a bowl like a dog, it was something I tried to do myself. The weird thing about this confession is that I was in my twenties when I did it! This entry was posted in Uncategorized on April 13, 2015 by stripfix. This entry was posted in Uncategorized on April 14, 2015 by stripfix. Lynn's Comments: Everyone likes to brag about the intellectual prowess of their family pooch. Sadly, the real dog, Farley, was something of a lost cause! We took him to special dog training classes and worked hard to implement everything we were taught to do. Daily, we applied the routines, the commands and behaviours. We rewarded and we praised. Farley refused to catch on. Whatever he did learn was minimal. It was discouraging. We had imagined him walking at heel, sitting on command, and coming when called. Other dogs could master these simple skills, but Farley was consistent. He did what he felt like doing, when he felt like doing it, and he trained US to behave according to his whims. This entry was posted in Uncategorized on April 15, 2015 by stripfix. Lynn's Comments: They told us at the kennel club (we were members of The Old English Sheepdog Association) that we needed to be persistent, authoritative, and to take charge. Having no children at the time, we had time to learn how to train a dog and considered this good practice for parenting later on! This entry was posted in Uncategorized on April 16, 2015 by stripfix. Lynn's Comments: This was one of the exercises we were given to teach Farley to come when called. My husband and I did this endlessly, but to no avail. The trainers blamed us for Farley's lack of success. They said we were not being consistent and should try harder. We did. We believed that with enough repetition, with enough rewards, Farley would learn. He didn't. This entry was posted in Uncategorized on April 17, 2015 by stripfix. Lynn's Comments: Sadly, we never did celebrate success with the real Farley. In the comic strip, however, the outcome to every scenario was up to me, so cartoon Farley was an obedient, and even rather smart, companion. This entry was posted in Uncategorized on April 18, 2015 by stripfix. Lynn's Comments: A few years ago, I lost a load of weight. I was thrilled with myself, and in celebration, I gave away all my larger clothing--swearing to the walls and windows that I would never gain back those excess pounds. Last week, I went looking for a favourite pair of pants only to realize they had been jettisoned during my THIN period. Pity. They would have fit me quite nicely, now! This entry was posted in Uncategorized on April 19, 2015 by stripfix. Lynn's Comments: At the time when I was working in our dental clinic, recorded music for headphones and office ambience was hard to come by. A small cassette player was all we could offer our patients, and eventually they had heard all of the albums we owned. We were living in an area where radio reception was intermittent at best, and satellite stations hadn't been invented yet. What we had was an enormous reel-to-reel system and about 10 huge reels of tunes we had prepared ourselves. We thought this would be enough music to last forever considering the number of albums we had recorded (illegally, I now realize), but after a few months, as the reels played, were changed, and played again, we could all hum the next tune before it even started! This entry was posted in Uncategorized on April 20, 2015 by stripfix. Lynn's Comments: One thing we always had in our clinic was new reading material. Thinking of the patients, we subscribed to a variety of magazines, and children's books were replaced as soon as they looked soiled or dog-eared. People really appreciated this small waiting room diversion, and often said so. Whenever I go into an office or a clinic and I see that there are a variety of reasonably fresh and current magazines, I feel a little better about the folks who run that office. There, on the coffee table in front of me, is evidence that they care. This entry was posted in Uncategorized on April 21, 2015 by stripfix. Lynn's Comments: "Brittany" is the name of one of my friends' daughters. I knew her family would be pleasantly surprised when they saw it in the strip. Little things like this were a lot of fun. Later, the Scott family became five, as their other children, Bourton and Elly were born. I never put another Scott family name in the strip, but I suspect their daughter, Elly was named for Elly in the strip! This entry was posted in Uncategorized on April 22, 2015 by stripfix. This entry was posted in Uncategorized on April 23, 2015 by stripfix. Lynn's Comments: One thing that was not abundantly clear to my audience was that when Elly was working, Michael was in the care of Annie, who lived next door. This was the way it was with us. Aaron, at the age of ten, was under the watchful eye of wonderful Marian, who lived across the street. She cared for my daughter (five years younger than Aaron) as well. Aaron had a key to our house, and was trusted to be there with Marian's supervision, so it didn't seem out of line for me to show Michael at home, into the cookies, and on his own. People complained--and rightly so. This was not a good idea. I would have said so, too, but I was living in a community where everything was within walking distance, and I was looking at things from a different point of view. What's interesting about living in a very small, closely knit community is that everyone looks after everyone else--perhaps too closely, and that scenarios like this are common. Aaron was safe in Lynn Lake, Manitoba, but might not have been in another, larger community like the one in which the "Pattersons" lived. I was constantly mixing the reality of our personal lives with the imaginary lives of the people in For Better or For Worse. Sometimes, I just didn't consider the different living conditions of the two families and think things through! This entry was posted in Uncategorized on April 24, 2015 by stripfix. This entry was posted in Uncategorized on April 25, 2015 by stripfix. This entry was posted in Uncategorized on April 26, 2015 by stripfix. Lynn's Comments: The day I received a call from my first publisher to say he was interested in publishing my book, I was in shock. It was something I desperately wanted to hear but couldn't believe I was actually hearing it! This entry was posted in Uncategorized on April 27, 2015 by stripfix. 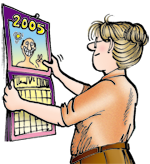 Lynn's Comments: I was equally pleased to have my single panel cartoons accepted by our small local newspaper, "The Dundas Valley Journal." I was in my late 20s, a single mom, and at the time, working at a job I didn't enjoy. Seeing my cartoons published in a real paper with a real audience validated what I was doing and told me there was hope. I could see the possibility of making a living doing what I did best! In the FBorFW comic strips you see here, I substituted writing for drawing, but Elly is me--overwhelmed to see an open door in front of her--just waiting for her to go through. This entry was posted in Uncategorized on April 28, 2015 by stripfix. Lynn's Comments: I think what I was trying to say here is that a lot of published poetry is without rhyme. The poetry I like best is that which incorporates rhythm and rhyme--much like the lyrics of a song. I was also trying to say that when you do see your work in print, out there for an audience to read and remark on, it looks entirely different. It has significance, it means more than it did when you first read it to yourself and decided it was good enough to share. The combination of fear, pride and exhilaration compels you to do more, and to do it better. That's how success begins. This entry was posted in Uncategorized on April 29, 2015 by stripfix. This entry was posted in Uncategorized on April 30, 2015 by stripfix.